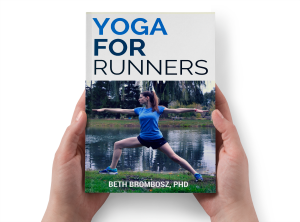 I am so passionate about yoga for runners because yoga really does make you a better runner. First, it helps you resist injury by making you stronger and more flexible. Yoga also helps you improve your breathing and breath control. You’ll practice taking deep, full breaths, which will help you get in more oxygen while you’re running. Yoga also really helps you be a mentally stronger runner. You’ll learn how to push through tough training runs, and you’ll learn how to control negative thoughts that can affect your performance. Running is just as tough (or even tougher) mentally as it is physically. To hit that PR or run your longest race yet, you really do need to have great mental strength, too. Just finished a peak race? Here’s why you should start a yoga practice, #runner! First things first: don’t rush into anything after a peak race. Your body needs time to recover. If you’ve just run a very hard, long race like a marathon, take some time off to let yourself heal. It can be helpful to do some very gentle yoga poses to help you stretch and to get the blood flowing through your muscles. Keep this stretching very light, and only stretch to a point where it feels comfortable. You can practice yoga at a yoga studio, at a gym, or at home with videos or books. Many runners feel most comfortable practicing at home or at a gym; sometimes yoga studios can seem too intimidating or too “woo woo.” It’s totally fine to combine in-person classes with home sessions, too. Sometimes your schedule doesn’t allow you to make it to the gym or to a studio, so it’s smart to have a backup plan to practice at home. 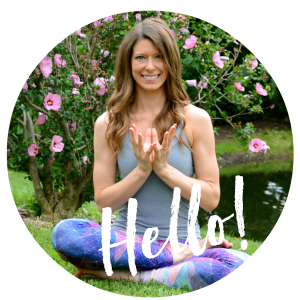 So what do you need to start a yoga practice? If you’re going to be doing yoga at a studio or gym exclusively, you may not need any equipment at all. The studio or gym may provide mats and props for you. But, that equipment may not be very high quality (especially the mats). If you’re serious about getting into yoga, I strongly suggest runners get a decent yoga mat and a yoga block. Other yoga props can definitely be helpful, but you may not need them. Keep in mind that all yoga classes aren’t the same. Many runners are drawn to power yoga or vinyasa classes because they can feel more like a workout. But, there are other styles of yoga that can be great for runners, too. Consider checking out a restorative or yin class as a slow, gentle compliment to your strenuous running training. I know many runners who started out as power yoga junkies, but now they crave restorative classes. It’s all about finding a teacher and a class that fits your needs! I try to do 20-30 minutes of yoga at least once a week during training. When I’m not in training (which is rare these days), I do less yoga and activity in general. But I do love it for the balance during training! All about yoga during training and the off season! Now, if only I would do it now that I’m neither in nor out of a season!